Film transfers include a professional quality “frame by frame” transfer to the media of your choice – DVD (included), Blu-Ray (included), hard drive (customer provides), thumb drive (customer provides) or cloud. Each DVD transfer includes a 100-year scratch-resistant archive disk, printed label, a case and printed case wrap. 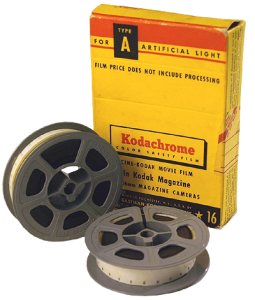 Transfer up to 1,700 feet of Reg8, Super8 and 16mm, sound or silent, film to standard definition or high definition discs.